The operating cycle for a diesel engine with Kruse Limited Temperature is identical to Diesel's original cycle except that a proportion of the fuel is injected into the cylinder to begin the compression ignition event and further quantities of fuel are injected to achieve isothermal expansion during the power stroke. The result is a lower peak combustion temperature and a reduction in the quantity of pollutants, such as NOx. More detail on the Kruse Limited Temperature Cycle may be found in the Kruse Technology section. The induction stroke in a Diesel engine is used to draw in a new volume of charge air into the cylinder. As the power generated in an engine is dependent on the quantity of fuel burnt during combustion and that in turn is determined by the volume of air (oxygen) present, most diesel engines use turbochargers to force air into the cylinder during the induction stroke. From a theoretical perspective, each of the strokes in the cycle complete at Top Dead Centre (TDC) or Bottom Dead Centre (BDC), but in practicality, in order to overcome mechanical valve delays and the inertia of the new charge air, and to take advantage of the momentum of the exhaust gases, each of the strokes invariably begin and end outside the 0, 180, 360, 540 and 720 (0) degree crank positions (see valve timing chart). 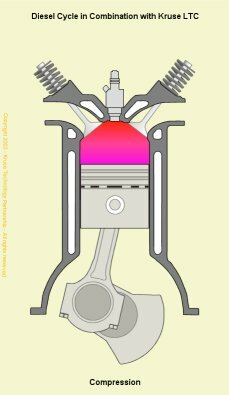 The compression stroke begins as the inlet valve closes and the piston is driven upwards in the cylinder bore by the momentum of the crankshaft and flywheel. 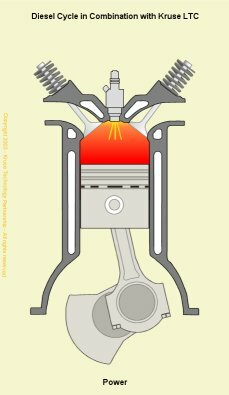 The purpose of the compression stroke in a Diesel engine is to raise the temperature of the charge air to the point where fuel injected into the cylinder spontaneously ignites. In this cycle, the separation of fuel from the charge air eliminates problems with auto-ignition and therefore allows Diesel engines to operate at much higher compression ratios than those currently in production with the Otto Cycle. 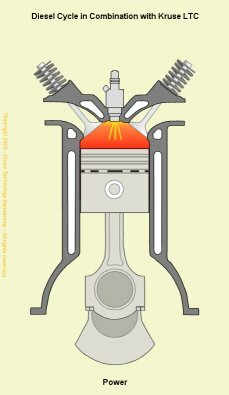 Compression ignition takes place when fuel directly injected into the cylinder with a high pressure fuel injector spontaneously ignites. In conventional diesel engines, all the fuel is injected at this point, but in LTC Diesel engines only a portion of the fuel is injected. This limits the peak combustion temperature and thereby reduces the quantity of NOx created. Full power is achieved by injecting the remaining quantity of fuel during the power stroke (see below). 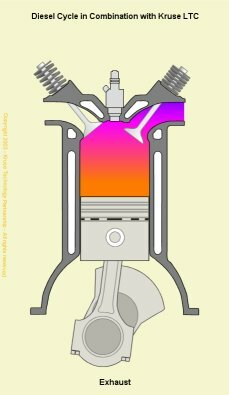 The power stroke begins as the injected fuel spontaneously ignites with the air in the cylinder and the pressure generated by the combustion process forces the piston downwards in the cylinder. As illustrated in the adjacent figure, when the Diesel cycle is combined with the Kruse Limited Temperature Cycle, the remaining quantity of fuel is injected in one or more injections during the power stroke. The exhaust stroke is as critical to the smooth and efficient operation of the engine as that of induction. As the name suggests, it's the stroke during which the gases formed during combustion are ejected from the cylinder. This needs to be as complete a process as possible, as any remaining gases displace an equivalent volume of the new charge air and leads to a reduction in the maximum possible power. 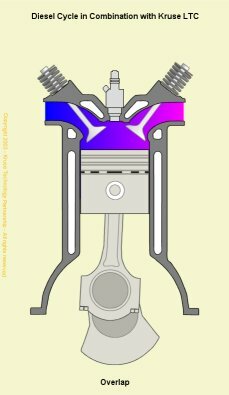 Exhaust and inlet valve overlap is the transition between the exhaust and inlet strokes and is a practical necessity for the efficient running of any internal combustion engine. 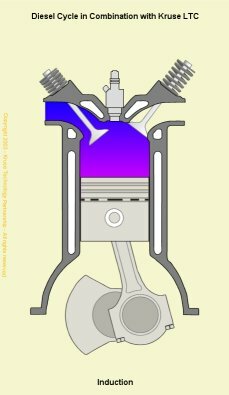 Given the constraints imposed by the operation of mechanical valves and the inertia of the air in the inlet manifold, it is necessary to begin opening the inlet valve before the piston reaches Top Dead Centre (TDC) on the exhaust stroke. Likewise, in order to effectively remove all of the combustion gases, the exhaust valve remains open until after TDC. Thus, there is a point in each full cycle when both exhaust and inlet valves are open. The number of degrees over which this occurs and the proportional split across TDC is very much dependent on the engine design and the speed at which it operates.